At Queen Mary Dark Harbor 2018, what's old is new again, thanks to revamped mazes that send visitors into previously uncharted waters. For Halloween 2018, Queen Mary Dark Harbor continues to position itself as a haunt-themed destination event, a place where visitors can relax and imbibe spirits while drinking in the ambiance and/or watching the outdoor equivalent of a floor show. With multiple bars and stages, it may be best to think of Dark Harbor as a giant nightclub; the mazes are only a portion of the entertainment. That portion has shrunk by 14% this Halloween, since the retirement of Soulmate reduces the number of mazes from seven to six. With no new maze to fill the void, the Queen Mary may seem to be visiting the same old ports of call instead of boldly cruising into new adventures; fortunately, the crew has changed the course of each maze, revealing (or in some cases concealing) new sights and sounds. The degree of variation is different from maze to maze, but some are virtually new experiences. 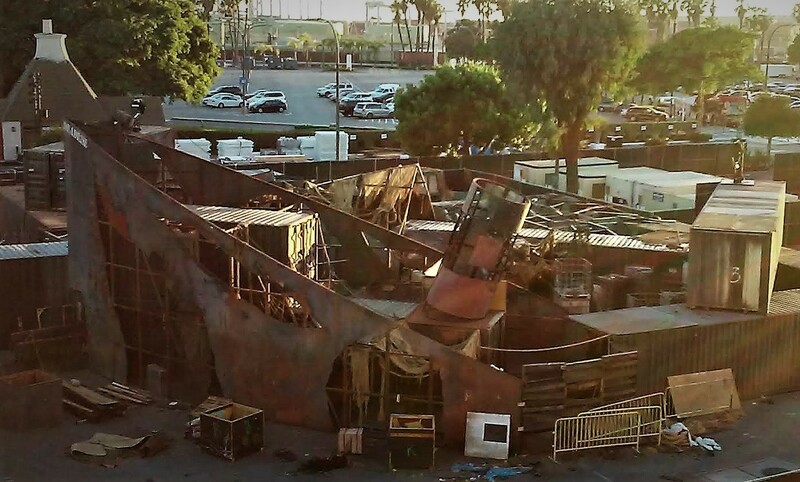 One characteristic running through the mazes at Queen Mary Dark Harbor 2018 is disorientation, often caused by darkness. Lighting is minimal, sometimes virtually non-existent, making it difficult to navigate those old, familiar passageways. Even when the lights are on, there may be a forking path or two, creating a truly maze-like effect. Recognizable elements may or may not be on view; in some cases, set pieces and characters have been removed or re-purposed. The skull-faced cavern entrance seen last Halloween in Intrepid now serves as the entrance to the Ice Cave bar. New monsters were haunting B340. We did not see Half-Hatch Harry searching for his legs in Deadrise. And Graceful Gale, with no maze of her own, was nowhere to be seen (except as a mannequin near the entrance). This Halloween, the Queen Mary has ensconced several bars among its mazes and challenged guests to find them. We encountered two, one fairly well hidden, the other pretty much out in the open. Though we appreciate the novelty of this idea, we were not in a mood to halt our progress during our first pass through the mazes; nevertheless, sitting down to enjoy briny cocktails such as the Watery Grave and the S.O.S. would be a tempting treat during repeat visits. The most obviously altered of Queen Mary Dark Harbor 2018's mazes is Feast, which has been relocated in order to make room for Illusions of the Passed, Aiden Sinclair's "Theatrical Séance" (reviewed here), which occupies several rooms used for the maze last Halloween. Feast is now in the engineering section at the stern of the massive ship, which is an odd fit for a theme about a chef specializing in cannibal culinary creations. Last year, Feast began with what felt like an approach to a luxurious dining area before going behind-the-scenes to reveal the horror in the kitchen. 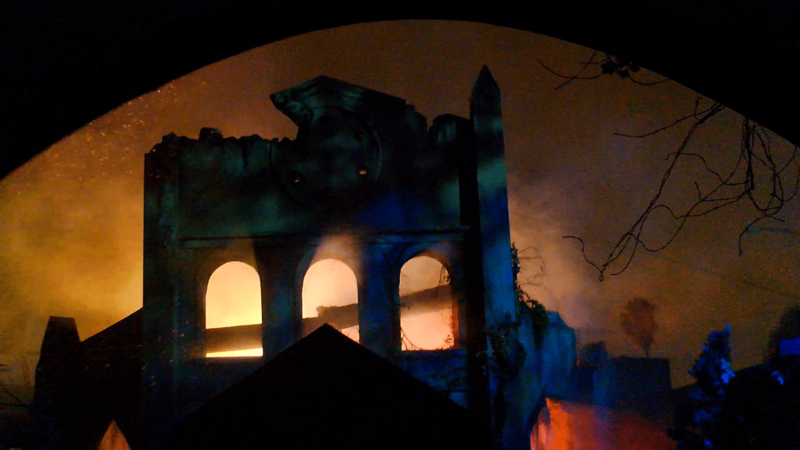 The new location attempts to simulate this jarring transition, but the surroundings are not suitable for pulling off the illusion. It's too obvious that we're in an employees-only section of the ship from the beginning, and there is little sense of being in a kitchen; except for a dining table with some unpleasant entrées, not much relates to the theme. The one familiar set piece is the walk-in oven, glowing red and threatening. This year, there is no crawl space and no sense of being trapped; you just pass through and enjoy the view. Fortunately, the corridors and rooms are wonderfully suited for a haunted maze; filled with machinery, they offer many hiding places, of which the monsters take the most advantage. We just wish that the Dark Harbor crew would design a maze specifically for this space instead of relocating inappropriate mazes into it. Last Halloween, the same thing happened to Soulmate, which moved into this slot for its final appearance. Now we wonder whether this is a cursed area where mazes go to die. The B340 maze has changed so much it's virtually new. Though still haunted by Samuel the Savage, you will not see much of the familiar character. The school room sets, chalk boards, and nuns that used to fill in his back story are gone, and the script has been rewritten so that Samuel is no longer simply a maniac on a homicidal rampage. Instead, a voice-over reveals that his murders involved ritual sacrifice, and the ship's dark corridors are now home to strange, distorted creatures lurking in dark corners and sometimes overhead - presumably demons unleashed from Hell by Samuel's ritual slayings. As before, B340 includes the long catwalk over a vertigo-inducing drop to the hull below. The maze also features a particularly grizzly scene in which visitors must navigate a path through the hanging entrails of Samuel's victims. 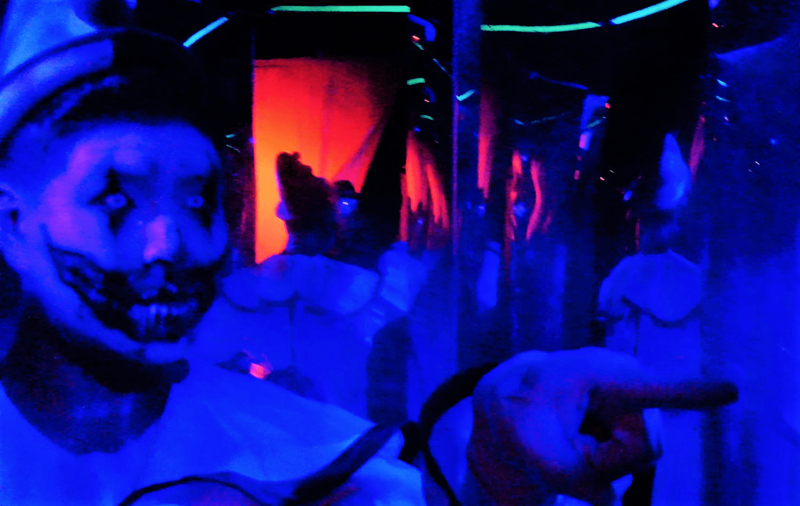 B340 has never bee one of our favorites, but this revamped version is the most intense and visceral maze at Queen Mary Dark Harbor 2018. 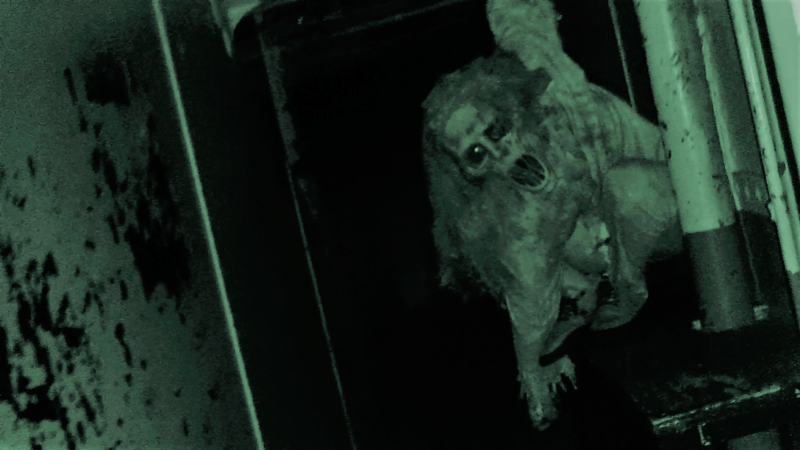 Lullaby still features Scary Mary, the demented child-ghost demanding that visitors stop and play with her forever, but the emphasis has been shifted. Gone are the water imagery and effects - the famous swimming pool in the depths of the ship is no longer seen - and we heard only a brief reference to Mary's death by drowning. Instead, Scary Mary has been re-imagined as a having been possessed by a demonic spirit inhabiting a teddy bear, which apparently drove her to her commit suicide in the Queen Mary's swimming pool. We're not sure the changes are improvements, but they freshen up a maze that has been around a few years. The first of three mazes on land, Intrepid contains one of the most pleasing additions to Queen Mary Dark Harbor 2018: a fantastic exterior setting, representing Edinburgh Station, complete with falling snow for an ethereal effect worthy of a Tim Burton movie. The setting captures a feeling of old-school Halloween horror that we dearly love. The rest of the maze shows notable changes. Intrepid still begins with a train "ride" - actually, walk through some train carriages - but there is no longer a foundry smelting iron to build the Queen Mary. Instead, the stop at Edinburgh station leads directly to the interior of the Fisherman's Village buildings, where most of the maze is set. The stone corridors, festooned with skeletons and sometimes draped in a layer of mist, are inhabited by masked characters with raven-like beaks. What this has to do with forging the Queen Mary is anyone's guess. Presumably we're inside a haunted castle somewhere in Scotland. When the Iron Master (Intrepid's signature character) shows up at the end to ask how we liked the ship he helped build, it feels like a vestige of the maze's original intent, a leftover bit retained to link the landlocked maze to the Queen Mary. But who cares when haunt itself is so much fun? Much of Queen Mary Dark Harbor 2018 feels like a circus, with acrobats performing aerial stunts near the Dome (which is again empty this Halloween) while other circus characters work a small stage near the maze's entrance. You may see the Circus Master here, schmoozing with guests, but he's not really presiding within the maze itself. The Circus maze seems to take visitors behind the scenes of the entertainment performed outside the maze. There is a somewhat grungy backstage feel: exhausted performers are glimpsed in silhouette, hitting the booze, and workers claim you're in a dangerous construction area or demand that you help shovel elephant dung. You still walk through bouncing rubber balls, but they are only ankle deep this Halloween. There is a vertigo tunnel and a real mirror-maze, with some unhelpful clowns (figuratively and literally) misleading you on your twisted journey. A trapeze artist bungee-jumps down at you (a gag ported over from the Knotts Berry Farm Halloween Haunt). Overall, the colorful settings and costumes offer a welcome contrast with the dark and dreary corridors of the Queen Mary, but we still think the circus theme is somewhat out of place at Dark Harbor. How about a cryptozoological aquarium instead? We have never been completely sold on Deadrise's attempt to simulate a sunken ship - its proximity to a the Queen Mary provides too clear a contrast - but the drowned sailors inside usually distract us from our quibbles about the setting. This Halloween, Deadrise is more like a real maze, with multiple paths dividing crowds as they maneuver through the wreckage. Even with the distraction of flashing fireballs overhead, it seems fairly easy to find your way through, until you come to a dead end (a bit of a cheat, with a false wall). Being fanatical maze-lovers, we almost never pause long enough to sample other amenities at Dark Harbor (except for the always enjoyable Panic 4D movie experience, a fast-paced 3D thrill-ride with in-theatre effects). This Halloween, we made an exception, taking advantage of the opportunities to relax between each walk through the depths of the Queen Mary. The acrobatics and other performances on view from our cabana provided an enjoyable way to pass the time while savoring excellent food: chipotle fries, "impossible" burger (a disturbingly convincing veggie burger), and nitro shake (cold brew coffee with ice cream). Our conclusion: Queen Mary Dark Harbor 2018 is as much fun as any Halloween popup bar we have visited - a great place to hang out even after you're done with the mazes. Were there not so many other haunts to visit, we would happily return for a more relaxing saunter through the Queen Mary's haunted corridors, kicking up our heels at the hidden bars in the hope of sharing a drink with Scary Mary or one of the other resident spooks. Come to think of it, since The Captain, the Voodoo Priestess, and Graceful Gale no longer have mazes of their own to haunt, they should make a point of hanging out in the bars, like out-of-work actors drowning their sorrows in alcohol while rambling drunkenly about the good old days when they used to be somebody. That sight would be truly worth the price of a second admission, along with the VIP upcharge to access the hidden watering holes. Queen Mary Dark Harbor 2018 is like a giant Halloween-themed nightclub with entertaining stage shows and more than enough bars to get your fill of spirits. Though all the mazes are holdovers, they have been revamped to send visitors into previously uncharted waters. 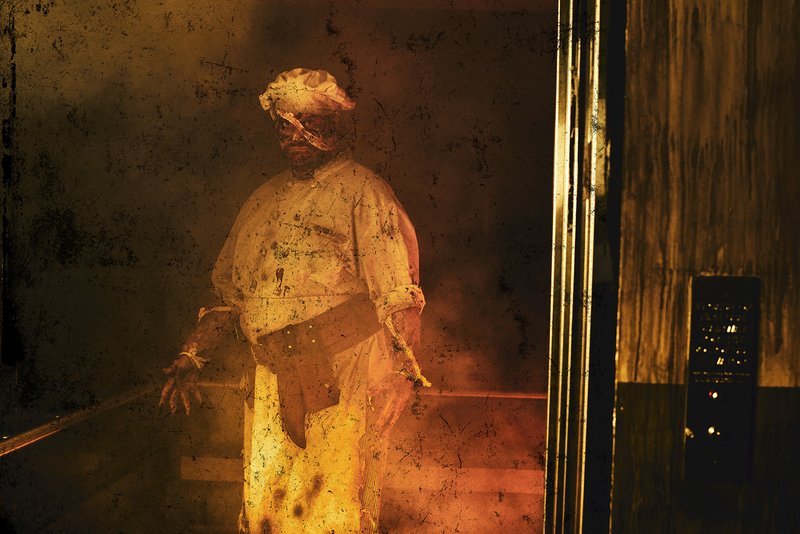 Dark Harbor continues at The Queen Mary on select nights through November 2. The address is 1126 Queens Highway, Long Beach, CA 90802. 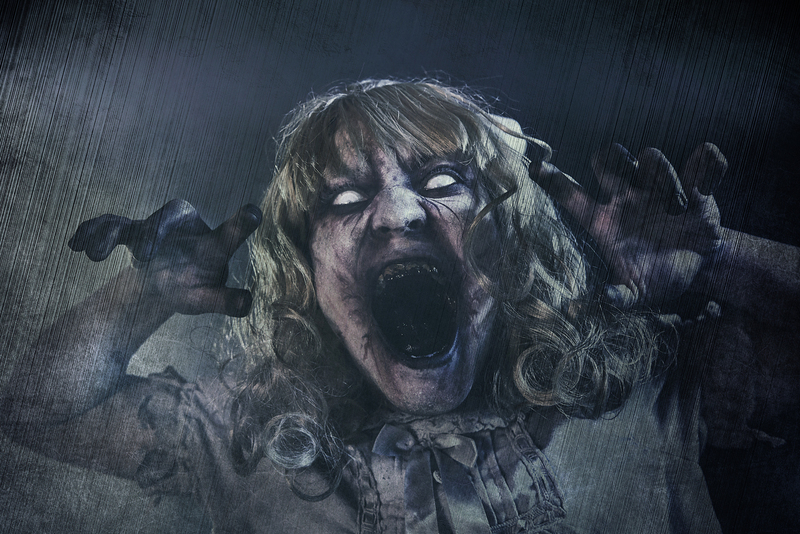 Dark Harbor tickets grant admission onto the Queen Mary from 4-9pm (tours and exhibits require additional fees). Dark Harbor does not allow re-entry, so it is best to visit the Queen Mary before entering Dark Harbor. For two nights only, October 20 and 27, Queen Marry is offering combination tickets for Dark Harbor and Illusions of the Passed. Call 562-435-3511 for more information, or visit the website.